This tote has the distinctive looks of the Le Pliage with some handy features. Most expandable bags simply get bigger by releasing a few zips. They remain essentially the same bags, just a bit bigger. However the central portion of this Le Pliage unzips completely, so you can put it back together as a brand new, smaller purse. You'll want its full strength while you're in transit, but its smaller mode is ideal for sightseeing and regular days back at home. This Le Pliage's functional features don't stop there. It's not just a great travel bag; it's a decent everyday option. Its tubular handles will be too short for easy carrying if the generous main compartment is full, but there's a grosgrain cross-body strap to help us out. 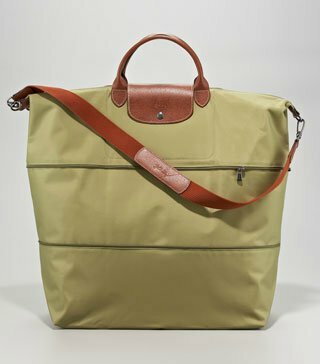 I only wish Longchamp had added more pockets to the roomy interior. The single pouch has a lot of work to do. I can overlook at that for the price though. I'd hardly call a nylon bag costing $235 a bargain, but the designer pedigree and convertible design of this one makes it worth the money. The Longchamp Le Pliage Folding bag, a great alternative to this expandable bag.